For both the Wireless LAN Controller and autonomous APs, you also have an option of using the Cisco Graphical User Interface (GUI) to perform your configuration. This GUI is web-based and can be configured to operate over HTTP or HTTPS. Because the WLC module may be embedded in a switch, firewall, or router, you may find that some WLC management is performed through one of Cisco’s other management interfaces, such as Cisco’s Security Device Manager (SDM) or Adaptive Security Device Manager (ASDM). The SDM can be launched from the web management interface of Cisco’s Integrated Services Router (ISR). The ASDM is the main management interface for Cisco’s Adaptive Security Appliance (ASA) firewalls and is also launched through the web management interface. 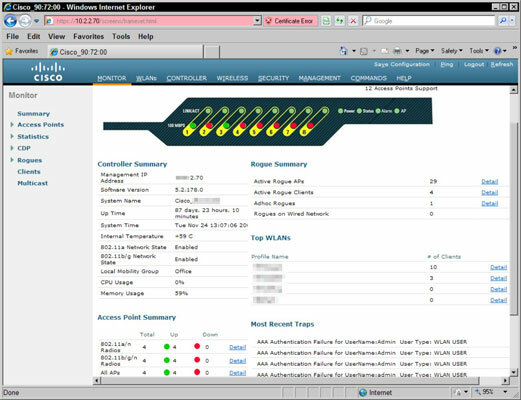 A sample of the web interface used for managing the Cisco 2106 WLC is shown; the interface for the 4400 series WLC and 5500 series WLC is similar. 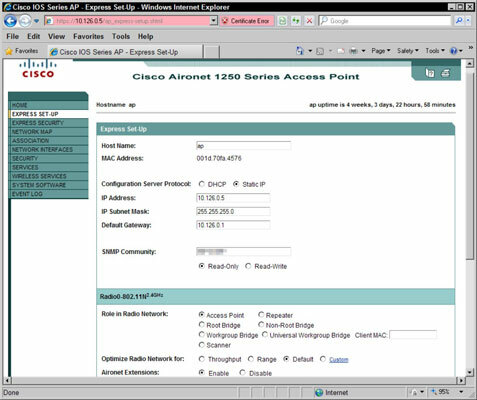 The management interface for the Autonomous mode Cisco 1250 Series Access Point is shown below. Note that its interface appears quite different from that of the WLC you saw earlier. In this case, the SSID management is found in the SSID Manager on the Security menu (located in the left menu), whereas the WLC has SSID settings on the WLAN menu. The other interface that is quite different is that of the Cisco ASA firewalls using the ASDM, which is shown in following figure. 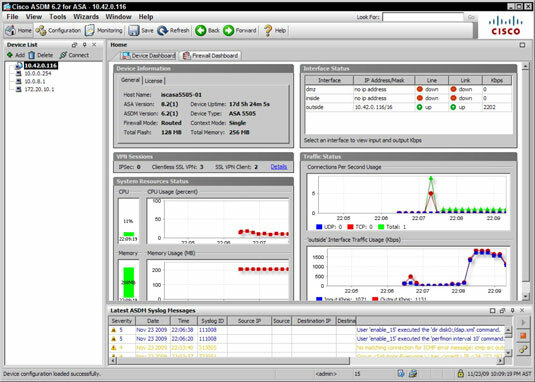 This interface is shown only to illustrate the differences in Cisco’s management tools, because the company has a wide set of tools for its appliances. In the case of the ASDM, Cisco uses the web interface on the ASA firewall to launch a Java applet which is the ASDM. By using a Java applet, Cisco has more options available to manage windows and controls (such as radio buttons and check boxes) that can be limiting in a web interface.